Rev. 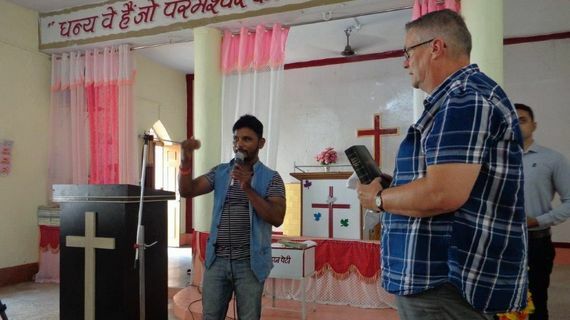 Ruud Phaf travels regularly to India, Pakistan, China and Africa to preach the message of Jesus love to the poor. God has given him a great compassion for these peoples. We would like to invite you, to have a look for the pictures of the mission-trips. 1- Sunday Service - on 10th.sept. As it was sunday morning I got opportunity to share God's Word with the Church. It was Evangelical Lutheran Church (ELC)where I have shared my own personal testimonies and scriptures with the Believers. 2- Personal Evangelism - By God's grace I could able to share God's amazing Love with two young Hindu sister's at barbar shop and we have prayed with them and these two sister's indeed believed on the Lord Jesus . 3- House Church- on particular days we went for house churches. And there also we exhort the believers with the Word of God and it was one of the wonderful experience for me. 4- House Visiting- during the week even we went for house visiting and with those families we could share God's word and prayed for them. 5- Counseling - Personal Counseling- it was blessed time to give counseling from God's Word to sisters. One sister came to us with lot of brokeness and she wanted to commit suicide but we prayed for her and we reminded her Gods promise and love, finally she went with joy. Family counselling - even some of the family couple came for prayer and for advice and we gave God's counseling and word to them and encouraged them in prayer. The Foundation is urgently looking for people who are willing to pray for the missionary work and to financial support. We need sponsors who want to help us with a small donation every month. Please, let us know if you can help us.